Ratio and Proportion Questions for SSC CGL BANK POO SO and other government exam. Note: the value of ratio remains same if we multiply or divide the numerator and denominator of a fraction by the same number. In the proportion 2 : 5 : : 4 : 10, the end terms 2 and 10 are called extremes and the middle terms 5 and 4 are called means. Continued proportion and third proportion : If a/b = b/c , then a, b, and c are said to be in continued proportion and c is called the third proportion. The third proportion of a and b is b^2 / a. Fourth proportion : if a, b, c and d are in proportion then d is called the fourth proportion. The fourth proportion of a, b and c is bc / a . 6. In X lite mixture, the ratio of water and milk is p : q. How many liters of water should be added to this mixture so that the ratio will become r : s.
Allegation rule : The two ingredients should be mixed in the inverse ratio of the differences of the two given prices and the mean price i.e. Note : C.P. 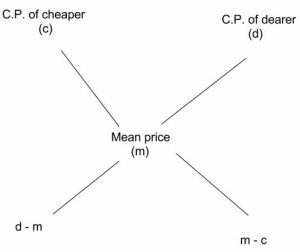 of unit quantity of the mixture is called the mean price.